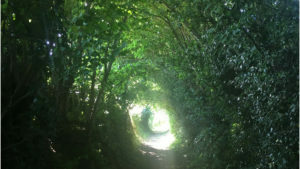 Halsway Manor is pleased to announce the appointment of not one, but two poets in residence, as part of our Heritage Lottery Fund activities. 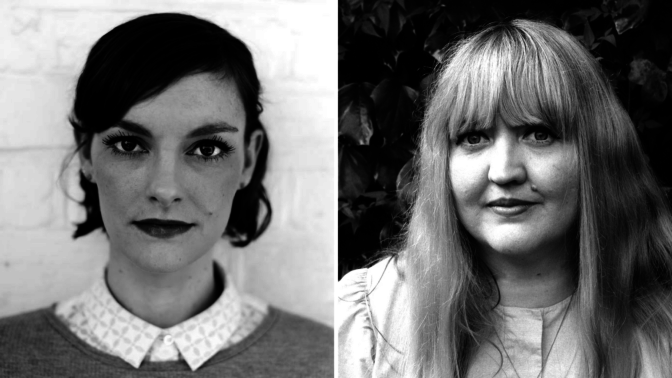 Over the next year poets Rebecca Perry and Amy Key will be in residence at Halsway, absorbing the world of the manor, researching in the library, exploring the surrounding area and creating a new collaborative body of work inspired by their time here, to be published in pamphlet form. There will be a chance during their residency for members of public to engage with their work through a talk or workshop. Rebecca Perry is the author of a number of publications including 2015’s Beauty/Beauty, published by Bloodaxe books, which was a Poetry Book Society Recommendation, shortlisted for the T S Eliot Prize, the Seamus Heaney Prize for Best First Collection, The Fenton Aldeburgh Prize for Best First Collection and winner of the Michael Murphy Memorial Prize. Amy Key is the author of the brilliant Isn’t Forever, Bloodaxe books, 2018, and Luxe, Salt Publishing, 2013, as well as two pamphlets. Isn’t Forever is a Poetry Book Society Wild Card Choice. She founded the wonderful, now archived journal, Poems in Which, which Rebecca later also edited. Both poets have published extensively in magazines and anthologies, run workshops and worked as editors, supporting new up and coming poets as well as developing their own work. We wanted to come to Halsway without a defined plan for what shape our residency will take. We wanted to be genuinely open and responsive to whatever kind of spell Halsway might put us under, alert to what we would learn and discover there. Our visit, which took place while the manor was closed to the public, became something of a reconnaissance mission. Who might we want to meet and talk to during our residency? What materials, objects, papers and books might we have access to? What did it feel like to be in the manor and the grounds? What could we explore nearby? We were able to get an initial feel of all of these things. We spoke to staff and volunteers from the manor. Alice, Halsway’s Creative Lead, drove us up to Dead Woman’s Ditch and we walked into the witchy woods there, feeling the temperature drop and the atmosphere immediately change. We walked along the path and saw the sea on the horizon; met the horses and their foals grazing there. Later that day we had a tour of the library and each took stacks of books into the garden (it was a beautiful day) and kept interrupting each other’s reading so we could share something interesting we found. We barely sat a minute in silence before finding something we had to share. So many things snagged our attention: books on folklore, fairy tales, witchcraft, the life stories of English folk dancers, the lyrics and origin of folk songs. We wandered the ground, smelling the flowers, admiring the lichen, wondering if the specific orange of it came from the salt in the air. In the manor we ran our fingers over the witch marks on the fireplace, stepped over construction materials to peer into the upstairs bedrooms and wonder about the ghost stories we’d been told, carefully leafed through books more than 200 years old. Returning from dinner in the evening, we sat in a small gravel yard as evening fell, drinking wine and listening to the bleats of the sheep in the opposite field. It was a particularly unique privilege to roam the manor and the surrounding area in this way; absorbing the atmosphere of the place, being absolutely free with how we interacted with our surroundings, settling on nothing. One of the many wonderful things about this residency is that freedom – ideas have started to form in our minds about how we will collaborate to create new work there – but we will let Halsway work its particular magic, both during our visits and when we are away from it. When we made our first trip to Halsway Manor in August, we had the idea that we would like to visit once in each season of the year, to see the manor in all of its moods. 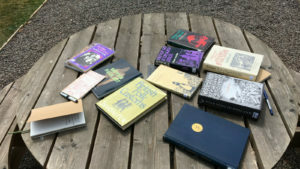 We had beautiful weather for our summer trip – the main house was undergoing renovation and empty apart from us – and we spent hours outside in the gardens and in the library looking through piles of books and journals. Our autumn visit took place over the weekend the clocks went back. The roses in the garden were gone, replaced with flowering lavender and the last bees of the year. The scaffolding had come down and we saw the exterior in all its glory. The manor was full of songwriters and basket weavers; the sound of singing moved along the corridors and up through the floor when we sat in our room working. The evenings arrived early and mornings came with mist on the windows. A bright blue sky quickly turned dark on the top of a hill in Exmoor and we found ourselves in the middle of a hail shower. The house certainly had a different feeling this time: cosy, bustling and very much approaching Halloween. On our first visit, we scoured the library and archives at random, picking up books with appealing covers and intriguing titles. This time we were more selective in our research, focusing in on books by women writers and those that dealt with spells and witchcraft. We photocopied pages and pages of travelogues and wonderful old books on ceremonies and customs, then worked on erasure poems and abecedaries (where each line of a poem begins with a new letter in alphabetical order) using the same source material. It was fascinating to see where our interpretations varied and where we’d both been drawn in by the same word or phrase – pink silk or a deep, dark river. We both felt the publication we’re working towards start to take shape, imagining its contents, how it might look and feel. We also talked about what we could offer to the community around Halsway as part of our residency. In the new year we will lead a poetry workshop where we will share some of the amazing texts from Halsway’s library and will support participants to write new poems inspired by them. Keep a lookout for more details about this, including how you can sign up, in coming weeks.